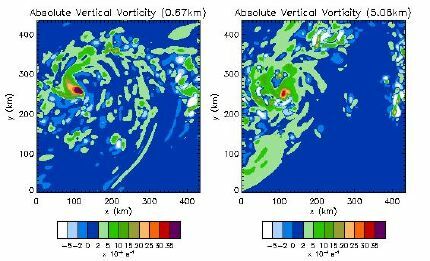 This report summarizes research completed since IWTC-IV that contributes to an improved understanding of tropical cyclone (TC) formation using numerical models. Without doubt, TC formation is the least understood phase of the TC life cycle. Lack of an observational network over the open ocean is the main reason for our limited understanding of the formation process. In open ocean (data-sparse) regions we are usually limited to satellite (visual, infrared, and scatterometer) data, which provides useful albeit incomplete information. With recent advances in computer technology it is now possible to numerically simulate TC formation at cloud resolving scales in three space dimensions beginning with arbitrary initial data. Direct numerical simulations thus offer an unprecedented opportunity to fill the information gap with a physically consistent data set covering the formation phase. The simulation data can be diagnosed much like data from a field campaign in order to gain basic understanding of the formation process, as well as processes that might frustrate it. After briefly reviewing the nature of the TC formation problem, we summarize recent work using simple models to understand the influence of convective bursts within an incipient cyclonic vortex. Results using fully three-dimensional numerical weather prediction models are then described that support prior work and provide a new perspective on the formation process more generally. Historically, TC formation was viewed as the transformation of the cyclonic flow portion of a synoptic-scale tropical disturbance (the low pressure region of an easterly wave or monsoon trough, e.g.) into a surface concentrated vortex whose tangential winds decrease with increasing altitude above sea level. High spatial and temporal resolution satellite observations indicate, however, that the low pressure region of tropical disturbances are generally populated with mesoscale convective systems and mesoscale convective vortices (MCVs). Visual evidence of organized coherent structures within an incipient tropical disturbance thus motivates a redefinition of the TC formation problem that recognizes the multi-scale nature of the problem. For the transformation process to be successful both synoptic-scale structures (~1000 km) and mesoscale structures (~100  200 km) are believed necessary. Deep convective bursts (`hot towers or `circular exhaust clouds; e.g., Gentry et al. 1970) and convective downdrafts represent a third motion scale (~10-50 km) whose role in the formation process is also believed crucial. Very little in-situ data is available concerning either the structure of these convective bursts or how the bursts quantitatively influence the formation process. Research efforts since IWTC-IV have concentrated primarily on using numerical models to provide quantitative information on the impact of convective bursts in the overall formation process. Thought experiments carried out since IWTC-IV using simple models have provided fundamental insight into the processes by which episodes of deep cumulus convection, and the corresponding vortex-tube stretching that accompanies these episodes, can progressively strengthen an incipient vortex associated with an MCV or pre-existing weak cyclonic vortex embedded within the low pressure region associated with an easterly wave or monsoon trough. A variety of idealized but fully nonlinear numerical experiments have shown that convectively induced cyclonic PV anomalies in the lower troposphere can intensify an incipient cyclonic vortex through vortex merger and vortex axisymmetrization to a tropical storm or hurricane on realistic time scales (Montgomery and Enagonio 1998; Moller and Montgomery 1999; Nolan and Farrell 1999; Moller and Montgomery 2000: Enagonio and Montgomery 2001; Reasor and Montgomery 2001; Montgomery and Brunet 2002). Carrying out numerical experiments with relatively high wave amplitudes on an initially monotonic PV basic state that initially supports no discrete vortex Rossby wave modes, Montgomery and Enagonio (1998) and Moller and Montgomery (1999, 2000) showed that a vortex Rossby wave eigenmode is induced that interacts with the incipient vortex. In a model with explicit cumulus convection these findings suggest the possibility that the vortex can sustain the eigenmode, which itself can interact with the convection and then feed back to the vortex. While three-dimensional numerical weather prediction efforts to study the physics of TC formation since IWTC-IV are not numerous, three noteworthy studies have recently been accomplished that furnish new insight into the role of deep convection in the formation process. The three studies of Davis and Bosart (2000), Davis and Bosart (2002), and Hendricks (2002) are motivated by a real case, that of the formation of Hurricane Diana (1984). Diana formed near the east coast of Florida in September 1984 and was close to a good observational network. Building on earlier work of Bosart and Bartlo (1991) who provided the observational foundation for the Diana case, Davis and Bosart (2000; hereafter DB00) used the Penn. State/NCAR MM5 to gain more detailed understanding of the formation process. Bosart and Bartlo (1991) and Montgomery and Farrell (1993) both suggested that the upper-level eastward-moving cut off potential vorticity (PV) anomaly was the crucial forcing agent in this case. DB00 verified this by re-running the MM5 model without the upper-level PV anomaly and observing no development of a cyclonic surface vortex. Although the Diana case is unique because of the strong influence of the baroclinic forcing, the vortex phenomenology described below may nevertheless be germane to the formation process in the deep tropics where baroclinic forcing is absent. Employing a 9 km horizontal grid spacing on the finest grid and a Khain-Fritsch cumulus parameterization scheme, the numerical simulation of Diana by DB00 suggested a three-phase process: baroclinic and barotropic growth; moistening; and air-sea interaction. DB00 concluded that during the baroclinic and barotropic growth phase the axisymmetrization of remote convectively induced PV anomalies was important in the development of a tropical storm strength surface vortex that eventually became Hurricane Diana. Davis and Bosart (2002) continued their study of the Diana case with a sensitivity analysis to various parameters and concluded that the prediction of tropical cyclones currently pushes the limits of predictability. For the remainder of this report we focus on the thirteen-hour period that constitutes the baroclinc and barotropic growth phase. To obtain a more complete understanding of the underlying organization process that resulted in Diana, two higher resolution numerical simulations of Diana have been performed by C. Davis of NCAR using 3 km and 1.2 km horizontal grid spacing, respectively, on the innermost grid with no cumulus parameterization. Although the 3 km simulation is perhaps slightly on the coarse side by cloud dynamics standards, the main findings from the 3 km simulation are generally supported by the 1.2 km numerical simulation (C. Davis, personal communication). We thus focus on the 3 km simulation. A comprehensive study of the 3 km cloud resolving simulation has been completed by E. Hendricks (2002) and the principal findings of his study are summarized here. Figure 1. Characteristic structure of numerically simulated hot towers in the MM5 Diana simulation using a horizontal grid spacing of 3 km. Top row: Horizontal contour plot at z = 5.08 km and vertical profile of core diabatic heating rate (K/h) as diagnosed from the simulation at t = 26.16 h. Bottom row: Horizontal contour plot at z = 5.71 km and vertical profile of core vertical velocity (m/s) as diagnosed from the simulation at t = 26.16 h. These results are representative of the simulated hot towers during the entire formation phase of Diana. the vorticity (and PV) anomalies are subsequently maintained by deep convection in their cores throughout the merger episodes. Note the small horizontal scale (~20 km) of the two PV anomalies undergoing merger and axisymmetrization. At the completion of the merger event highlighted by Fig. 2 the vortex has attained tropical storm strength. Figure 2: Two snapshots of absolute (vertical) vorticity at two vertical model levels (z=0.67 km and z = 5.08 km, respectively) in the MM5 Diana cloud resolving simulation employing a horizontal grid spacing of 3 km. Color bar denotes range of vorticity values being displayed, in units of 10-4 s-1. (A) Absolute vorticity at t = 34 h for the two vertical levels. (B) Absolute vorticity at t = 36 h.
During vortex mergers and other local events, the evolution of the simulated flow that eventually becomes Diana is found to proceed via quasi-balanced vortex dynamics, evolving slowly in approximate gradient and hydrostatic balance and forced primarily by the mean diabatic heating rate associated with the hot towers. The highly vortical nature of the hot towers in pre-hurricane environments is argued to be the reason for this quasi-balanced evolution. 1. We recommend increased emphasis on documenting the lifecycle of hot towers, including their attendant vorticity and PV signatures, during the formation of TCs. Cloud resolving numerical models in idealized configurations should be used for this purpose so as to isolate the basic dynamics of and interactions between these important structures in pre-hurricane environments. general circulation models currently being used to assess the impact of global warming scenarios on TC frequency. 3. While outside the strict area of numerical modeling, we recommend increased emphasis on obtaining in-situ data during the TC formation period, including both flight-level data and airborne Doppler radar data. This data is essential to assess the realism of high-resolution cloud resolving simulations, such as the Diana case shown above. 4. We strongly endorse the exchange of information via email among various TC modeling and observational groups. We encourage the holding of workshops to carry out model intercomparisons and diagnostic studies of idealized and operational cases. The simple modeling studies suggest that low-level vortex merger and vortex axisymmetrization of cyclonic PV anomalies induced by deep penetrative convection (hot towers or circular exhaust clouds) within or near an incipient MCV or surface vortex can progressively strengthen a vortex on realistic time scales. The Diana case study confirms the importance of low-level vortex merger and vortex axisymmetrization processes. Whether the formation process in the deep tropics proceeds along similar lines with the hot towers playing an essential role in the organization process remains an open question. Further three-dimensional modeling studies using idealized flow configurations are advocated to obtain a more complete understanding of the multi-scale upscale energy cascade process suggested here. Support from the U.S. National Science Foundation and Colorado State University enabled the participation of M. T. Montgomery in the workshop. baroclinic environment. Mon. Wea. Rev., 119, 1979  2013.
genesis of Hurricane Diana (1984). Part I: Control simulation. Mon Wea Rev., 129, 1859  1881.
genesis of Hurricane Diana (1984). Part II: Sensitivity of track and intensity prediction. Mon Wea. Rev., 130, 1100  1124.
convectively forced vortex Rossby waves in a shallow water primitive equation model. J. Atmos. Sci., 58, 685  706.
satellite and radar observations of Hurricane Gladys, 1968. J. Appl. Meteorol., 9, 837  850. Hurricane intensification in a barotropic model. J. Atmos. Sci., 56, 1674  1687.
evolution via potential vorticity anomalies in a three dimensional balance model. J. Atmos. Sci., 57, 3366  3387.
formation. J. Atmos. Sci, 50, 285  310.
convectively forced vortex Rossby waves in a three-dimensional quasigeostrophic model. J. Atmos. Sci., 55, 3176  3207.
experiments for tropical cyclone and polar vortex interiors. Dyns. Atmos. Oceans, 35, 179  204. Nolan, D. and B. F. Farrell, 1999: The intensification of two dimensional swirling flows by stochastic asymmetric forcing. J. Atmos. Sci., 56, 3937  3962. 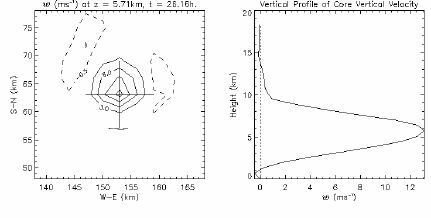 Reasor, P. D., and M. T. Montgomery, 2001: Three-dimensional alignment and co-rotation of weak TC-like vortices via linear vortex Rossby waves. J. Atmos. Sci., 58, 2306  2330.